I write this post because, in response to a ticket, I was asked to create a post on the forum to see if there was interest from other players about this thing. In short, the ticket I wrote was to ask that the chest of the sprite skill be moved (from the Random Interface to Normal one) since the chances of getting the skill I was looking for are almost nonexistent (having the chest 2% chance of going out and assuming that every object inside the chest has the same rate of exit, about 8%, makes it impossible to find that skill, having about a 0.2% chance every day). 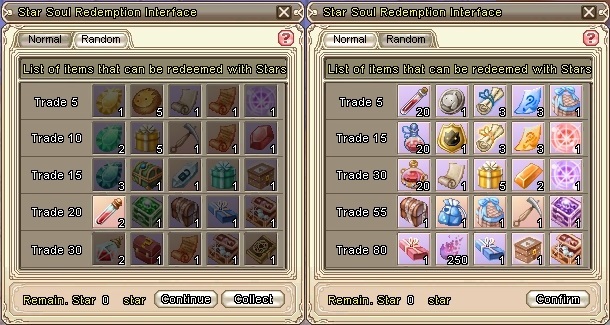 I will show you what is Star Soul Redemption and maybe with many feedback we can change some reward to make this thing more interesting since I think is not very valid momentarily and in fact many players do not even know what it is. 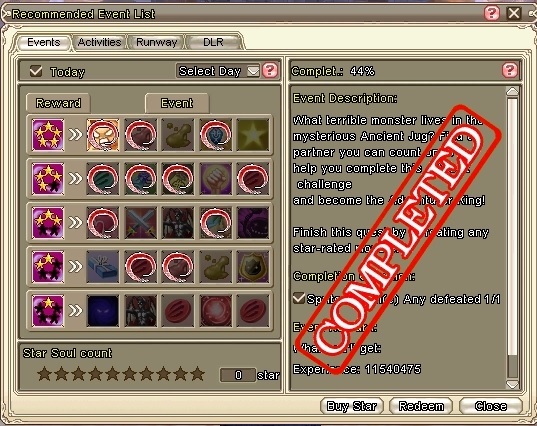 And while I write this post I take this opportunity to ask for your opinion on updating the possible awards of this mechanism that now is very dated to the point that it is completely ignored by most players. P.S. Informing me at the time it seems to me that no player has ever won one of the skills from that chest but contains skills that prove to be very useful. The Chest in question is in the fourth round of Random Mode. Few times I been able to reach four round and never got something good. And yes, random should have better stuff in early rounds... and better rate, always the tears, one use stuff or limited costume pack... for the effor of that day. The post was edited 1 time, last by Nya ( Dec 4th 2018 ). I have been a regular with soul star redemption. I'm pretty happy with the rewards so far and especially while I was levelling up the first time to 100 the extra lucky star tickets were nice for days when the dailies would reset twice (aka maint). I like them but I would recommend being able to get all the condensed/karma/rusty etc nuclei needed for alchemy armor through this table too in the first and second tiers. Rates for the 80 point tier have become hard because master alchemy boxes don't have the announcement rate they used to so there's no surefire easy way to go for them.